Many cultures have their own way of celebrating Christmas. Some prefer not to celebrate Christmas, but have a traditional way of celebrating an important event on their cultural calendar. Christmas can be a magical time of myths and legends. What could be more magical and enchanting than a jolly fat man in a red suit, flying around the world in his reindeer drawn sleigh delivering presents to all the children? As an incentive to be good throughout the year, on 6th December Santa’s evil twin roams the town hitting people with sticks if you have misbehaved in the past 12 months. In Hungary, Slovenia, and Bavaria this tradition, known as Krampus Night is hugely popular. Men don evil grotesque devil-like costumes and stagger around the townships armed with switches and sticks. The pooping log, or Caga Tio, is a strangely unique Christmas tradition. Revellers hollow out a log, prop it up on four stick legs and then paint a face on it. Every night in December Caga Tio is fed sweet treats and nuts and covered with a blanket to keep it warm. On Christmas Eve, usually before a roaring log fire, Caga Tio is beaten with a stick and ordered to poop. Chanting songs are sung until it poops out nuts and candies. On the last push, Caga Tio may reveal a knob of garlic or a salt herring. A predominantly Catholic population, church goers usually attend Mass between 16th and 24th December. Children hang long pieces of string to their big toes and hang the end of the string out the window. Church goers don skates and skate to church, tugging of the string as they pass by. Many Japanese celebrate Christmas in a very non-traditional way! They order Kentucky Fried Chicken! This has become such a popular Christmas activity, that KFC actually takes reservations for tables on Christmas Day, but many people miss out and have to eat their KFC at home. 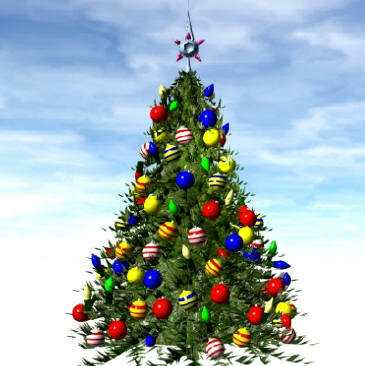 Christmas trees are adorned with all types of decorative ornaments. However, amongst the Christmas tree branches is an artificial spider and web. Tradition states that good luck befalls the one who finds the spider. A Ukrainian folk story says that a long time ago, a poor widowed mother had come upon hard times and was unable to decorate her Christmas tree. On Christmas morning, she awoke and was delighted that a spider had spun its web around her tree, making it sparkle and glisten with its beautiful web. The widow then had a very joyous Christmas. The British have a simple tradition to make all your Christmas wishes come true. Every family makes a Christmas pudding and each one has a turn at stirring the ingredients. Stirring the pudding will make all your wishes come true, so they say! Puddings sometimes have coins or tokens in them and luck will be yours if you happen to find one. Families then sit before a log fire, hung with xmas stockings, and eat their puddings with brandy sauce and custard. It is interesting and educational to see how other cultures celebrate the holiday period. However it is commemorated, Christmas is a time to spread joy and spend time with families and loved ones and to be charitable to those less fortunate.